T-Mobile might be in all sorts of trouble in the UK, but worldwide it's still pushing on with its Android revolution and to that end looks likely to be bringing a redesigned G1 to the masses later this year. The bizarrely named T-Mobile Bigfoot has been referred to on a leaked document as the G1 v.2, meaning that it's likely to take a few cues from the original handset but with a radical looking redesign. This means gone is the chunky lip and pop up screen, and in its place is a rounded chassis and slide out keyboard, which looks (from the teeny thumbnail) rather nice. The Samsung Hou... where's it gone? The leaked info made reference to another Android phone called the Samsung Houdini, which might be the recently announced i7500, but looks a little small from the picture. However, with all leaks like this, it's very hard to tell whether it's a done deal or just a projection from the sales teams, so we'll take the idea that Samsung has another Android phone all ready with a pinch of salt. 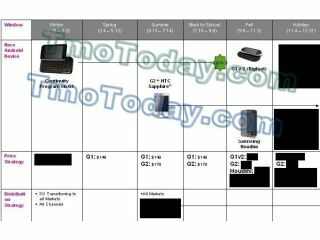 The same leaked slide also made reference to the HTC G2 Sapphire (a codename for the HTC Magic) which means all those mentioned are destined for the US market. However, it's highly unlikely that a new G1 phone (although not confirmed to be manufactured by HTC) would be confined to those shores given the original's success the world over. So, just as we predicted (well, hoped) it seems that 2009 really will be year of the Android deluge, and that can only be a good thing.